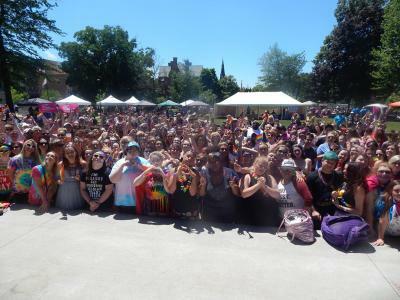 Members of Northwestern Pennsylvania Pride Alliance are gearing up for Erie's own Pridefest and parade. Across the country, rainbows will dot the landscape as cities celebrate Pride Month. Members of Northwestern Pennsylvania Pride Alliance are doing the same, gearing up for Erie's own Pridefest and parade. The celebration will begin at the Zone Dance Club in Erie where attendees are invited to assemble before marching down State St. at noon on Saturday, June 30. "Each Pride has its very own feeling. Our Pride tends to have a very family-friendly feeling," Alex Sphon, President of NWPA Pride Alliance, said. "It's not like some bigger city prides that seem to cater to certain demographics within the LGBT+ community. We're very inclusive. Everyone is welcome." In addition to activities for all ages, the festival will also have drag and musical performances. "This year one of the biggest things we wanted to do was have food capabilities at the festival," said Sphon. This year, Pridefest will host a local food truck as well as a local BBQ unit so attendees no longer have to leave the event to eat. HIV and STI testing will be available at the event, too. "The LGBT+ community has a much higher rate of HIV and STD and STIs," Sphon said. "We thought it was appropriate to offer this (free testing) service to, not only the LGBT community, but the entire community at an event like this." The bar is set high for this year's festival, especially after 2017's event, said Sphon. "This year our most challenging thing has been living up to our previous years expectations," he continued. "Last year was our 25th year and we had just over 1,000 people."